In what is being billed as 'unprecedented' circumstances, the incidents on June 5 and yesterday saw the flight data disappear from air controller screens. Markus Pohanka, a spokesman for Austro Control, said relevant EU agencies have been asked to investigate the 'unprecedented' situation. He added that other unnamed neighbouring countries had similar incidents and the EU's Eurocontrol, and European Aviation Safety Agency has been asked for a probe. It could have had dramatic consequences, as 4,000 planes take to the sky in Austria every day - with 50 in the air at any one time, according to the report. Air traffic was conducted 'blind' - by voice only - during the temporary outage, it claimed. The Boeing 777 - with 239 passengers and crew on board - vanished from civilian radar screens about an hour into the night flight. The search for the flight - which involves countries including the UK, the US, Australia, China, Japan, South Korea and New Zealand - has so far recovered nothing. 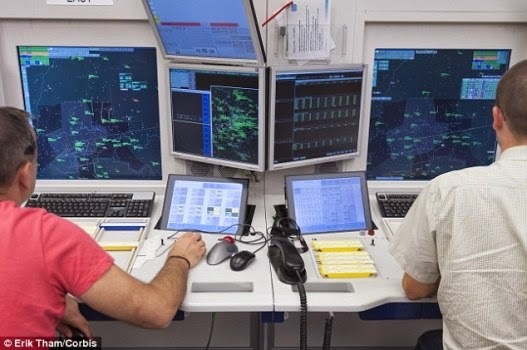 In relation to the 13 missing flights about Europe, Kurier cited unnamed experts as saying interference between the aircrafts' transponders and ground control was apparently to blame. So shall it be when the trumpet sounds. On a lighter note, maybe the aliens are here. What is happening? Something needs to be done. LINDA why is it that u usually like to swallow my comments. Na three ppl cause am PDP, APC or alien. Na una wen de fligh I de pity. Me I de ground kamkpe..lol! #The#end is near!!!! Be warn!!! And that's supposed to be cheering news? Really? I find it a little hard to believe 4,000 planes take off fault from Austria. But I've been wrong in the past. Aliens!!! Soon they will connect this to the missing Malaysian flight. Nna!! Dis varnishing & disappearing don dey 2much ooh! Pls wat book of d bible can I find it....nid to read my bible n get myself ready.....fear dey catch me. In the hands of almighty God we commit ourselves. yea its jst d bigining of such datz my blive..... neva trust d west! Mst evry news be a cheering news? Mtchewww! Tamotiye. No one know tomorrow. Be prepared and commitment now. It goes 2 show dat with all d technology humans feel dey ve God pass man. cant read, long essay but the headline is clear enough.. Which kind sign of the end time, we dey talk of location unknown, u dey talk of end time. Hand of Boko Haram,is it.